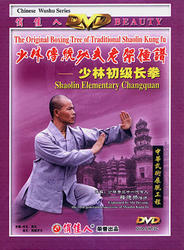 Shaolin Elementary Changquan is one of the first elementary boxing series in Shaolin Kung fu. Its movements are well arranged and regarded as the standard with the degree of difficulty. In whole routine consist of the different basic methods of hand, leg and jumping movements. You can practice it more often to constantly improve the strength, speed, endurance and other physical qualities and improve the interest for wushu.